Unbeaten Filipino boxing prospect Mark Magsayo will face Eduardo Montoya of Mexico on February 27, 2016 at Waterfront Hotel and Casino in Cebu. Magsayo who's coming off from impressive US debut defeating Yardley Suarez of Mexico via 1st round KO on StubHub Center, Carson, California, USA, he will try to continue his winning streak. 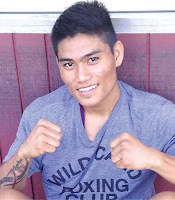 The 20 year old fighter from Tacloban City, Leyte, Philippines, is one of the top boxing prospect in the Philippines. Pacquiao and Donaire are not young anymore and Albert Pagara, KJ Cataraja and Mark Magasayo will try to take their place and continue to dominate for the Philippines. Mark Magsayo has an impressive record of 12W(10KO)-0L, he is a fighter who always coming forward and releases unpredictable flurry of punches. Magsayo is the current IBF World Youth Featherweight champion. The Mexican fighter Eduardo Montoya is from Reynosa, Tamaulipas, Mexico. He is only 22 year old and a KO fighter. He has a record consisting of 17 wins including 13 big wins by way of KO and has 4 defeats. Montoya won his last fight via TKO against Cipriano Garcia.